Bed bugs are usually small, brown blood-sucking bugs; when feeding they appear bright red. They feed on the blood of animals including people and pets. 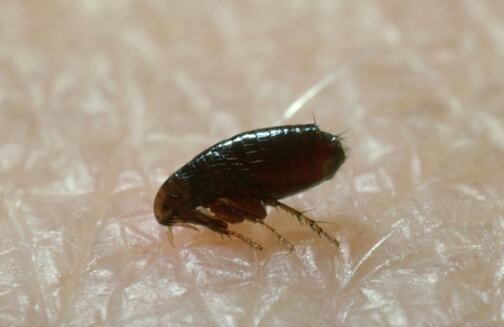 Bed bugs can survive up to a year without feeding. Bed bugs do not transmit diseases to humans but as the picture portrays they sometimes result in horrible, itchy bite marks. One female lays on average 3 to 5 adhesive eggs per day. Historically, fleas have been involved in devastating epidemics of plague throughout the world. Today in the Uk, fleas primarily are annoying biting pests of pets and people. The most common species is the cat flea, Ctenocephalides felis.. You are encouraged to learn more about the biology of fleas, especially the cat flea, so that you can make more informed decisions about health risks to you and your pets, how to avoid being bitten, how to prevent or suppress infestations, and whether flea control is warranted in and around your residence. Fleas live for about 100 days. Fleas do not fly. They jump from one place to another. A pair of fleas can produce 400-500 offspring in their lifetime. A flea can jump up to 8 inches high. That is 150 times its own height.